MARY TAYLOR SIMETI and her new book:SICILIAN SUMMER An adventure in cooking with my grandsons. Many of you would be familiar with the writings of Mary Taylor Simeti, one of the greatest authorities on Sicilian food. You may have a copy of her classic, in-depth, definitive book of the culinary history, traditions and recipes of Sicily called Pomp and Sustenance: Twenty Five Centuries of Sicilian Food. This was published in several editions and the same text was later republished as Sicilian Food: Recipes from Italy’s Abundant Isle. Or you may have read her other books about Sicily: On Persephone’s lsland: A Sicilian Journal, Travels with a Medieval Queen or Bitter Almonds: Recollections and Recipes from a Sicilian Girlhood. She has also written other books published in Italian as well as travel and food articles for various American, Italian and British publications including the New York Times and the London Financial Times. Her new book is called SICILIAN SUMMER: An Adventure in Cooking with My Grandsons. This time Mary takes us to her farm at Bosco, located some 40 miles west of Palermo in the hills overlooking the Gulf of Castellammare. The farm has been in the Simeti family since 1933. Mary and her husband Tonino inherited it in 1966 and is now a diversified farm of less than forty acres of vineyards, olive groves, fruit and vegetables with organic certification for their Bosco Falconeria wine, olive oil and produce. SICILIAN SUMMER: An Adventure in Cooking with My Grandsons, is an account and photographs of the food that Mary and her 4 grandsons (aged 13, 10, 7 and 5 years) cooked over 10 intensive, continuous days for the Simeti family – Mary and Tonino Simeti (the nonni), the four grandsons and the four children’s parents. The recipes that Mary and the boys prepare are all described and they use the abundant summer produce they themselves have helped to harvest from the fields: cucumbers, eggplants, tomatoes, almonds, zucchini blossoms and zucchini. And when you have abundance, you use the same vegetable to produce various dishes – there are numerous ways to eat tomatoes and the zucchini blossom is enjoyed battered, stuffed and cooked in pasta dishes. But it is so much more than a book of recipes suitable for her grandsons of various ages. Mary captures the pleasure that family brings when the three generations of the Simeti family gather on the farm each summer and she meditates on the role food can play within the family in bonding, consolidating tradition and identity and creating memories of her own childhood and those of her children. In between memories and recollections there is a beguiling mix of a family history and an account of the development of the farm that Mary and Tonino now share with their daughter, her husband and two grandsons. A little boat of burnished steel, it has holes in its hull through which tiny pieces of garlic rise up as you press it into the peeled cloves rocking back and forth on a cutting board. And I loved the description of Tonino. Grandson Matteo when young, would only see his grandfather once a year when he visited with his parents and brother from New York. Matteo was finding it difficult to relate to Tonino as he was unaccustomed and unfamiliar to him. But Mary describes how this all changed when the young Matteo … saw his grandfather drive up to the farmhouse on a tractor, a vision that in his mind would have outshone Apollo driving up in the chariot of the sun. Familiar or not, Tonino had achieved godhood. Mary reflects on the current plight of the world that her grandsons are growing up in and wonders about the cooking project she has undertaken with them: Am I compiling an album of childhood memories, scenes that will have some relevance to their adult lives, or will this be the record – even for them – of a lost and irretrievable Golden age? She hopes that these experiences in her kitchen will make these moments more significant and render their memories more indelible. The book ends with the preparation of the last meal for Tonino’s 79th birthday celebration. Scattered as we soon would be, the shared memory of the past ten days, the cooking and the laughing and eating together would link us firmly together. I have never felt closer to my grandchildren, more sure than our sense of family. Could this be the last summer that the Simeti family spends together? Sicilian Summer: An Adventure in Cooking with my Grandsons. The publication date is 25 September, but it is already available for pre-ordering on line, either in paperback form or as an ebook (search for them on line). Obviously, if you would rather support your local bookshop and help promote Mary’s writing by doing so, you could ask your favourite bookshop to order it. Mary Taylor Simeti is one of my heroes – I think that sometimes it takes a newcomer with a passion to observe and describe and rediscover what is Sicily and tease out the history behind the food (not that she is a newcomer any longer, she is part of Sicily, an expatriate who has spent all her adult life dedicated to her new homeland and appreciating its culture). I first posted the content of this post on Dec 20th, 2010. I called it: PER NATALE, COSA SI MANGIA? At Christmas, what do you eat? I am able to view the stats for each of my posts and all of the posts about Christmas have been viewed many times, but this one has not been popular. Is it the title? It contains some general information about the food that is common in Sicily around Christmas time but it also contains information about Panettone and Panforte – both popular at Christmas. There is also a recipe for Panforte. You are probably wondering what Sicilians eat for Christmas in Sicily. When the respected writer Mary Taylor Simeti (an expatriate American, married to a Sicilian organic wine maker and farmer and most importantly, one of the greatest authorities and writer about Sicilian food) visited Melbourne recently, she and I and pastry cook Marianna De Bartoli, who owns Dolcetti, a pasticceria in North Melbourne, were all asked this same question during an interview for Italianicious Magazine (Nov-Dec issue 2010). We all gave the same answer, which is that there is no one answer since the cuisine and traditional food of Sicily is very regional. Sicily may be a small island, but the food is very localised and very different from region to region. The three of us also agreed that Christmas Eve was more important than Christmas day – it is a meatless occasion and fish is the first choice. In some places Sicilians eat stoccofisso (stockfish) or baccala, where in others they eat eel. Usually families wait up and go to midnight Mass. And for those that do, Christmas lunch will often begin with a light first course. For example, chicken broth with maybe some pastina (small pasta suitable for broth) or polpettine (small meatballs) made with shredded cooked chicken meat, egg, a little fresh bread and grated cheese. In Ragusa, where my father’s family comes they tend to eat the same foods as they do at Easter: scacce and large ravioli stuffed with ricotta dressed with a strong ragu (meat sauce) made with tomato conserva (tomato paste) and pork meat. These are followed by some small sweets like cotognata (quince paste), nucateli and giuggiulena (sesame seed torrone). In other parts of the island gallina ripiena (stuffed chicken cooked in broth) is popular, while others may eat a baked pasta dish, for example: anelletti al forno. timballo di maccheroni or lasagne made with a very rich, strong meat ragu. This may be followed by capretto (kid) either roasted or braised. There may be cassata or cannoli for dessert or the wreath shaped buccellato made with dried figs, almonds, walnuts, sultanas and spices (from Latin buccellatum meaning ring or wreath). There are links to recipes for all the words in blue above. 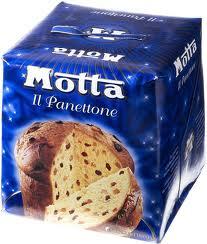 Both panettone and panforte are popular Christmas sweets in Italy. In recent years panforte has become popular in Australia, but you are probably more familiar with panettone. This may be because there are so many different brands of panettone available and they are exported to many parts of the world, especially in countries where Italians have migrated. Italians are very happy to buy both of these Christmas sweets and the big brands are of excellent quality. Generally Italians where ever they live would rather buy these than make them at home. I have never tried to make panettone but I have made panforte several times very successfully. This Christmas sweet bread is now popular not just in northern Italy where it originated. It is said that the early version of panettone ( means bread big) was not the light textured, yeast perfumed, fruit bread we are familiar with, before it was made common by industrial production. It was a type of heavy, enriched, Milanese fruit bread baked at home and not just eaten at Christmas time. Panettone was made famous and affordable when it was commercially produced (from the 1920’s) and railed all over Italy. As a child growing up in Trieste the most famous panettone was the Motta brand (and still a well known brand in Italy) and part of the charm was opening the box and releasing the fragrance. 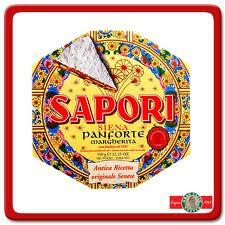 Panforte is from Siena (within Tuscany) and contains exotic spices of ancient times. It is made with dry fruit and nuts – candied orange peel, citron, chopped almonds, spices, honey, butter and sugar and very little flour to bind the ingredients; it has no yeast, has a very solid texture and is shaped like a disc. Panforte (from pane forte) means strong bread and in earlier times it may have been derived from the Tuscan pane pepato (peppered bread), meaning strongly peppered with spices. Just like panettone there are some excellent varieties of imported panforte. I like Panforte Margherita (the light coloured version developed in honour Queen Margaret of Savoy’s visit to Siena). Panforte Nero is the dark variety made with dark chocolate. Being a purist (or as my daughter used to refer to me as a food fascist) I cringe when I see ”gourmet” versions of panforte for sale, some of these contain glace cherries, or glace ginger; I even hesitate at the inclusion of pistachio or macadamia, not the norm, but could be more acceptable. My favourite recipe is from The Italian Baker by Carol Field (recipe below). In spite of writing recipes, I am not one for following recipes closely. I always improvise and adapt amounts of ingredients to suit my taste. For example I double the amount of pepper, nutmeg and coriander. 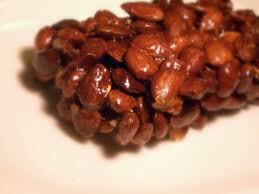 On occasions I have also included walnuts and pine nuts which were included in panpepato, a predecessor. If I make Panforte Nero I add unsweetened cocoa (Dutch cocoa powder about 2-3 tablespoons) and some bittersweet chocolate. Toast the hazelnuts on a baking sheet until the skins pop and blister, 10 to 15 minutes. Rub the skins from the hazelnuts in a kitchen towel. Toast the almonds on a baking sheet until very pale golden, about 10 to 15 minutes. Chop the almonds and hazelnuts very coarsely. Mix the nuts, orange peel, citron, lemon zest, flour, cinnamon, coriander, cloves, nutmeg and pepper together thoroughly in a large mixing bowl. Use a 9 inch springform pan; line the bottom and sides with baking paper Heat the sugar, honey, and butter in a large heavy saucepan over low heat, stirring constantly, until the syrup registers 242 to 248 on a candy thermometer (a little of the mixture will form a ball when dropped into cold water). Immediately pour the syrup into the nut mixture and stir quickly until thoroughly blended. Pour immediately into the prepared pan and smooth the top with a spatula. The batter will become stiff and sticky very quickly so you must work fast. Bake about 30 to 40 minutes. The panforte won’t colour or seem very firm even when ready, but it will harden as it cools. Cool on a rack until the cake is firm to the touch. Remove the side of the pan and invert the cake onto a sheet of paper. Peel off the baking paper. Dust heavily with confectioners’ sugar. I usually coat my cassata with marzipan and every time I do this people tell me how much they have enjoyed eating the marzipan and how it compliments the flavours of the cassata. The last time I made cassata with marzipan was Saturday 23 March at Food And Culture In Sicily: Easter Cookery Workshop offered by La Trobe University and once again the people who attended the session liked the marzipan and said that they had never enjoyed eating it in the past. The session began with a very interesting lecture on the history of food and feasting in Sicily, Italy and the Mediterranean. Dr Gillian Shepherd is Lecturer in Ancient Mediterranean Studies and Director of the A.D. Trendall Research Centre for Ancient Mediterranean Studies at La Trobe University. During her lecture she focused on the literary and archaeological evidence for food production and consumption in the ancient world. The lecture was followed with a food workshop and cooking demonstration that reflected the ways Sicilian cuisine has been influenced by the dominant cultures of the Mediterranean from ancient times to the modern day, which includes Greek, Roman, Arabic, French and Spanish cultures. The cassata was very appropriate for this session, not just because of its derivation, but also because it was essentially and still is an Easter dessert. In time it has also become popular for Christmas. Sicily produces large quantities of almonds and almond meal is used extensively for making traditional almond sweets and pastries. Marzipan fruit originate from Sicily and Sicilian pastry cooks are esteemed and employed all over Italy. Marzipan when made in the traditional method is made by cooking a strong syrup of sugar and water and then adding freshly ground almonds. The mixture is kneaded till smooth (like bread dough) and then shaped. The modern and easiest way is to make it with almond meal, icing sugar and water. It is still kneaded and rolled with a rolling pin. Unless you can buy fresh almond meal it is best to blanch the almonds and grind them yourself. Over the years I have been making marzipan and adapting a recipe from Bitter Almonds, Recollections and Recipes from a Sicilian girlhood. Maria Grammatico has a very famous pastry shop in Erice in Sicily and her recipes have been recorded by Mary Taylor Simeti. In a food processor, grind the almonds with about 2 tablespoons of the sugar until very fine, almost powdery. In a food processor or in an electric mixer, combine the nuts, the rest of the sugar, the water, vanilla, and the almond extract. Process or mix until the paste is very smooth. Remove to a marble slab or other cold work surface dusted with confectioners’ sugar and knead briefly by hand. Wrap in plastic wrap and refrigerate until ready to use. Marzipan will keep almost indefinitely in the refrigerator. ****This is what I do: I use 2 cups of ground almonds and 1 and ½ cups of pure icing sugar combined with ½ cup of caster sugar – this adds the crunchy texture that compliments the ground almonds. I really like the taste of natural almonds and if I am using fresh almonds I see no necessity to use vanilla or almond extract. I usually mix the sugars and almond meal with my fingers and add the water slowly. I am cautious with water because if the mixture is too wet I may need to add more almonds and sugar. I knead it as if I am making bread and if it needs more water I add it to make the mixture pliable. This is not the first time that I have written about Cassata or Easter or Marzipan and there are many other posts about these three topics on this blog. Buon natale e buone feste. Happy Christmas to everyone. I hope that you will eat well and that all your efforts will be appreciated by those who will share your cooking with you. The Feast of the Seven Fishes is a tradition which is strong among Americans of Sicilian and Southern Italian background and where they strongly adhere to eating seven different fish presented in seven different dishes. I n the past few years I have noticed that this “tradition” is beginning to creep into Australian Culture. I remember first hearing about this tradition when Mary Taylor Simeti and I were interviewed by Jane O’Connor for an article in the December 2010 issue of Italianicious. Mary is a highly respected and widely published writer on Sicilian cuisine and culture. Neither of us has ever found any trace of this tradition in Sicily and I have not experienced this with Sicilians in Australia. We agreed that it may be an example of how a little known custom may have travelled with Sicilian emigrants and taken on a greater significance in America. It is not the norm in Australia yet and we ought not confuse what is fact and what is fiction. 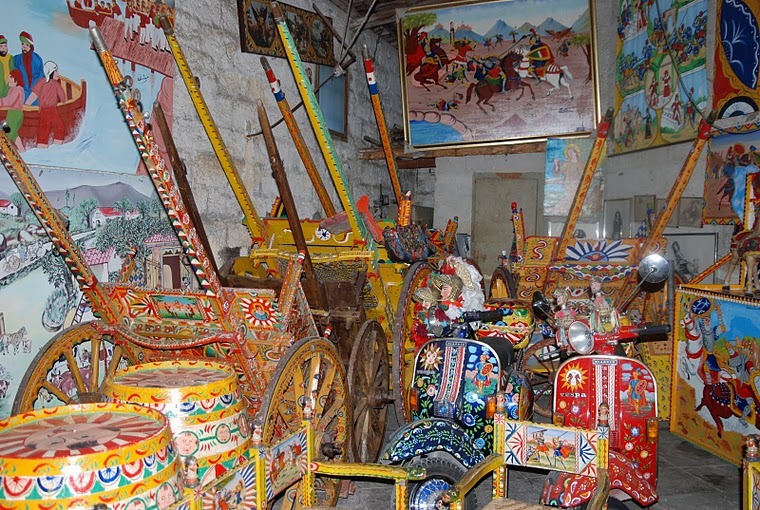 What is traditional in Sicily is usually traditional in other parts of Italy. And it is the custom to share a celebratory meal with family and friends on Christmas Eve. And yes, they do eat fish because traditionally in the Catholic Church it was a day of abstinence (when no meat was eaten on Fridays and specified holy days). Over time this meal has become the Christmas celebration. Midnight Mass follows and it made sense for Italians, who love food, to spend the time eating while waiting for Mass. They sleep in on Christmas day and eat sparingly. For Christmas lunch my parents had brodo and tortellini or polpettine (broth with tortellini or small chicken meat balls). They were too tired and replete from the night before. And why is seven the significant number? That’s anybody’s guess, and it is fun to speculate. There are so many things were seven is magic number: Is it the number of sacraments or the seven virtues or deadly sins? I also know that there are Seven Hills of Rome, a dance of the seven veils. I could go on. In my book, Sicilian Seafood Cooking, there are many recipes that could serve for Christmas Eve. I quite like the idea of cooking several courses and one could easily begin with a light seafood salad or a marinaded fish (thinly sliced and raw like a carpaccio) and progress to a lightly cooked whiting or a seafood pasta and then a heavier braised fish dish made with large thick slices of firm fleshed fish. Hopefully you will select sustainable fish for your recipes. Traditionally eel and baccalà or stockfish are eaten on Christmas eve in many parts of Italy. Those of you who have a copy of my book Sicilian Seafood Cooking will find recipes for these. This is the cover of the January – February issue of 2012 Italianicious magazine. It is a beautiful bi-monthly publication about food and wine, Italian regional recipes, travel stories and features on Italian restaurants and chefs and cultural events both in Italy and Australia. The photos are also stunning. The current editor, Danielle Gullaci, is continuing to develop the quality and look of the publication established by previous editor, Jane O’Connor. In the January-February issue Danielle has written a feature about me. “Although Marisa Raniolo Wilkins spent most of her early childhood in Trieste before moving to Australia with her Sicilian parents, a love for Sicilian food and culture has remained close to her heart. Her first book, Sicilian Seafood Cooking, represents eight years of hard work and a lifetime of culinary experiences. I was also featured in Italianicious magazine in the November-December issue when Mary Taylor Simeti and I discussed a Sicilian Christmas at Dolcetti, Melbourne’s little gem of a pastry shop. Naturally Pastry Chef Marianna Di Bartolo contributed to the discussion and we ate some of her delectable sweets. The editor was Jane O’Connor (now group editor of all Prime Media magazines), the three camera shy women and the photographer Patrick Varney of Raglan Images all had a grand old time. Mary Taylor Simeti is one of my heroes – I think that sometimes it takes a “foreigner ‘ with a passion to rediscover and tease out the history behind the food ( not that she is a foreigner, she is part of Sicily, having dedicated so many years to it.). 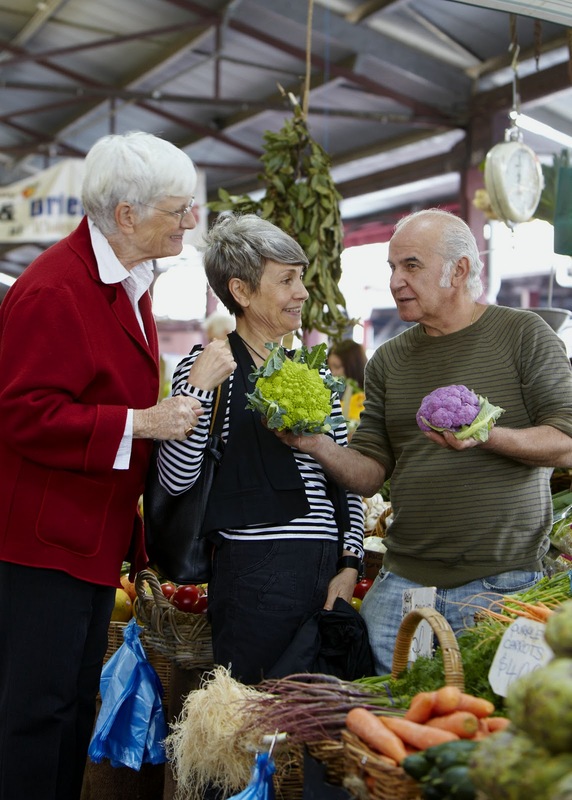 Mary and I talked to Gus about his produce at the Queen Victoria Market. The time before that Italianicious published an article and my recipe for Caponata, that was in December 2009 – February 2010 and the editor was Glynis Macri now Director/Editor of The Italian Traveller – Food, Wine and Travel Consultant. Here are the ingredients for one recipe. It is from the October 2011 issue. I have seen goat available at The Queen Victoria Market recently and the recipe uses Nero D’Avola – that marvellous Sicilian red wine. 4 potatoes, peeled and cut into quarters, then roasted with olive oil, garlic, sliced lemon and rosemary. The other nice thing that happened this week is that I went into Reader’s Feast Bookstore. 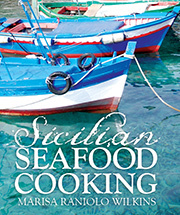 Sicilian Seafood Cooking has been featured in their Summer 2002 Book Guide and has been written by Helen. Helen is only one of the helpful, knowlegable and personable staff who has been working with Mary Dalmau at Reader’s Feast for a very long time. 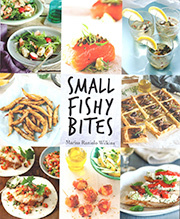 Finally my cookbook of the year is Sicilian Seafood Cooking by Marisa Raniolo Wilkins. the grandmothers and aunts are beside you. Happy Holiday Reading and Feasting. When I was a child growing up in Trieste at a particular time of the year my father and I would go to the railway station and collect a parcel, sent by relatives in Ragusa, Sicily. In it were irregular, round and oval shapes of cotognata and mostarda – not something that could be found in Trieste. Many are familiar with cotognata, quince paste that in Australia seems to have become very common on cheese platters. I have never eaten it with cheese in Sicily. Cotognata it is a sweet that has a relatively long shelf life and is traditionally kept for those times when unexpected visitors arrive. One cannot make a brutta figura and have nothing available at home to offer to guests. A few of you may be familiar with mostarda but perhaps what you are thinking of is mostarda of Cremona, mustard fruits in mustard oil and sugar and traditionally served with bollito misto di carne (a variety of boiled meats). Cremona is not in Sicily. Or you may have known mostarda as an ingredient for pumpkin tortelli (large tortellini – pasta pillows, similar to ravioli). This mostarda is generally made with quince. The Sicilian mostarda is similar and eaten in the same way as cotognata but it is made with grape must, wood ash, citrus zest and cornstarch. Some add almonds or pine nuts and raisins (as in the recipe by the goddess of all Sicilian recipes, Mary Taylor Simeti). Others add cinnamon, nutmeg and/or cloves. The ingredients are cooked until the must becomes thick, almost solid. 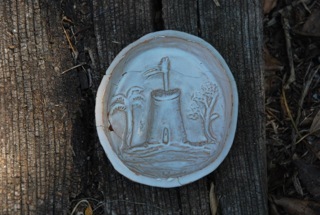 The mostarda is then poured into these type of moulds and dried in the sun. Like cotognata it is generally spread with granulated sugar when inverted and exposed again to the sun until they are completely dry. Now to the moulds. These belonged to my great grandmother and my brother has them hanging on his wall in the kitchen. I have a few, fond memories every time I see them. 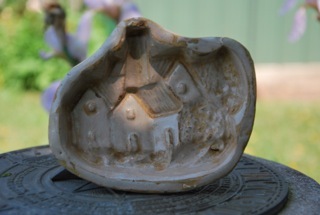 The moulds are called formelle. I was in Sydney where I attended some sessions of the Sydney International Food Festival. The World Chef Showcase on Saturday focused strongly on the cuisine of the Middle East and Mediterranean –this was the program that interested me the most. The Festival list of Australian and overseas guests was very impressive and included: Musa Dagdeviren (Istanbul), Yotam Ottolenghi (London), Mary Taylor Simeti (Sicily, food history), Joe Barza (Lebanon) and Kamal Mouzawak (founder of Beirut’s Souk el Tayeb – a weekly market farmers’ produce and Lebanese food), Anissa Helou (London), Ozden Ozsabuncuoglu (Turkish food authority) and Mehmet Gurs (Istanbul). Those of you who like Middle Eastern food and live in Melbourne will almost certainly know the names Ismail Tosun (Gigibaba) and Greg and Lucy Malouf (cookbook collaborators and Mo Mo Restaurant), also Abla Amad (Abla’s Restaurant). Sydney readers may recognise Somer Sivrioglu (Efendy Restaurant in Balmain). Abla Amad was accompanied by Yotam Ottolenghi who was relatively unknown in Australia at the time and i was one of the first to hear him at Abla’s session. There is an obvious and powerful connection between Middle Eastern and Sicilian cuisine – the Arabs ruled Sicily for two centuries (in medieval times they were sometimes called “Saracens” or “Moors”). The Arabs contributed to the development of Sicilian culture, agriculture and architecture and had a profound influence on the cuisine of Sicily. The food that was prepared and discussed by the participating Festival guests featured many of the distinctive ingredients of Middle Eastern food – the rich spices (especially saffron and cinnamon), rice and grains, nuts and seeds (especially pine nuts, almonds, pistachio, sesame), sugar, and the typical fruits (citrus, figs, pomegranate) and vegetables and flowers (orange, jasmine, rose flower waters) of the Mediterranean. The ‘Arab’ ingredients and flavours are not unique to Sicily. They are present in other countries of the Mediterranean, for example the cuisine of Spain and France. A post on my blog is not the venue to discuss this topic at length. However I have already written about some recipes of sweets that could be attributed to the co-Arab and Sicilian association (for they cannot be attributed just to the Arabs). Cubbaita (my relatives call it giuggiulena), gello di mellone, nucateli, riso nero (also called riso amauticato). Here is a similar recipe to cubbaita (giuggiulena) and it is called petrafennula, (also called petramennula depending on the Sicilian locality). All my Sicilian relatives and friends keep a selection of these small homemade sweets at home just in case someone visits unannounced. PETRAFENNULA – PIETRA DI MIELE (Rock made of honey). Place the honey in a saucepan. 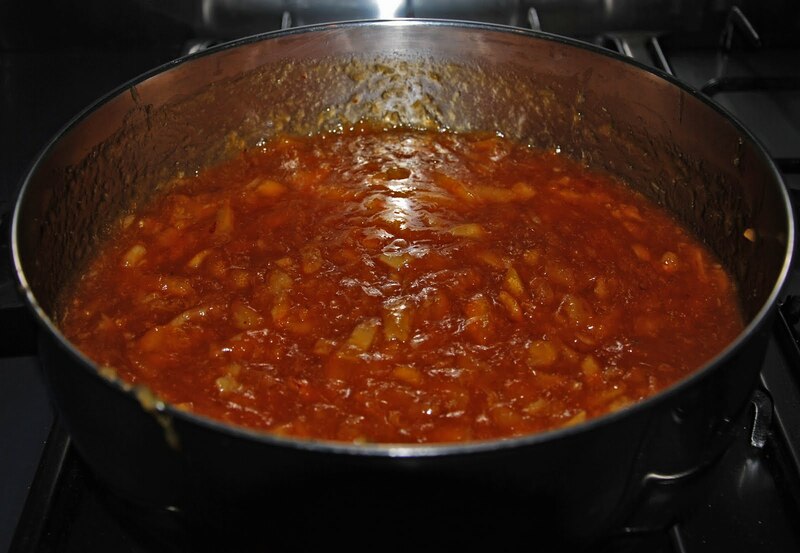 Allow the mixture to simmer gently and stir from time to time until it begins to solidify. Add the almonds and the cinnamon and stir gently to incorporate. Pour the mixture on to baking paper placed on a cold surface – such as a marble slab or a baking tray (traditionally this is done without paper on an oiled marble slab). Break it into pieces when it is cold. When my mother made this, she sometimes used to drop dollops of the mixture (about a tablespoon in size) on to a cold surface to form small odd shapes – more like pebbles than sharp rocks. This seemed easier than shaping it into one large slab, which then needs to be broken into smaller pieces. I have a friend in Adelaide who has the most wonderful garden and beehives. She used her honey to make giuggiulena and the petrafennula and both resulted into slightly softer versions of candy. We discussed this and think that it must be due to the varying levels of moisture in different types of honey and from the various locations. I have used a variety of honey including leatherwood (definitely not Sicilian) and other organic honey from a variety of Australian locations and have achieved the required results. LEMON MARMALADE TO USE IN SICILIAN PASTRIES. Conserva/ Marmellata di Limone (o di Cedro). Lately, I have fallen in love with the delicious Sicilian pastries from Dolcetti made by Marianna Di Bartolo. DOLCETTI, handmade sweet things (223 Victoria St, West Melbourne). Dolcetti means little sweets in Italian (it implies exquisite little morsels) and my frequent visits to this pasticceria has revived my desire for that distinctive, strong citrus taste present in many Sicilian desserts. 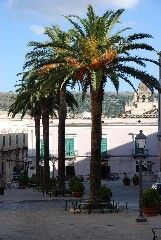 Sicilians produce a large range and quantities of citrus. One of the citrus is the cedro (citron). Cedri (plural) look like very large lemons and they have very thick skins. Sicilians use them fresh to make a salad (dressed with salt, extra virgin olive oil), but most of all they are candied (used for making cassata) or made into a sweet conserva (conserve/ jam/marmalade), especially common for flavouring desserts and placing in the centre of almond pastries. These may not be cedri, but the size and amount of pith on these lemons is comparable (each lemon weighed approx. 700g each). I decided to treat the lemons like cedri and make a conserva. Finding a recipe can be an interesting process. I do not think that I have ever followed a recipe from start to finish; I always enjoy finding and comparing recipes in the various publications, adding what I know and then modifying it to suit my tastes. Each of the numerous times I have visited Sicily (and Italy), I have bought cookery books – not only by the greats of Sicilian cuisine and highly recognized writers and publications (Coria, Correnti, Taylor Simeti, Tasca Lanza, ….I could go on), but also by the less known ones (Maria Consoli Sardo, Di Leo, D’Alba,….I could go on). The variations in the recipes (quantities and methods) I found in the different publications for making this preserve were many. Some recipes directed peeling the fruit first, others boiled the peel several times and discarded the water and some added sugar after boiling the pulp; there were almost as many variations for making marmalade as I found in my old Australian publications (for example The older South Australians may remember the Green and Gold Cookery book). The two recipes I ended up liking the most were: Marmellata di Limone (in Bitter Almonds, Maria Grammatico and Mary Taylor Simeti) and Conserva di Citru (in Profumi di Sicilia, Giuseppe Coria). 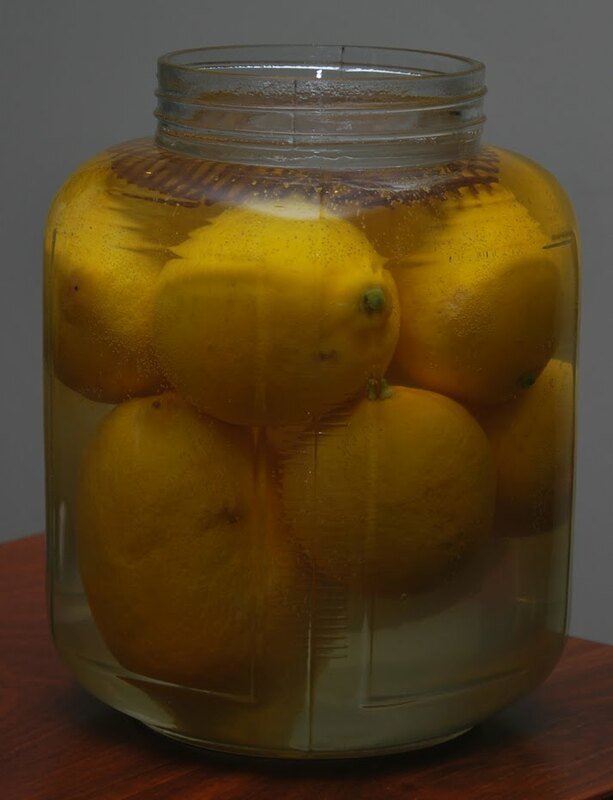 Maria Grammatico and Mary Taylor Simeti suggested pricking all of the lemons with a fork, putting them in water and letting them soak for 5 days, changing the water every day. 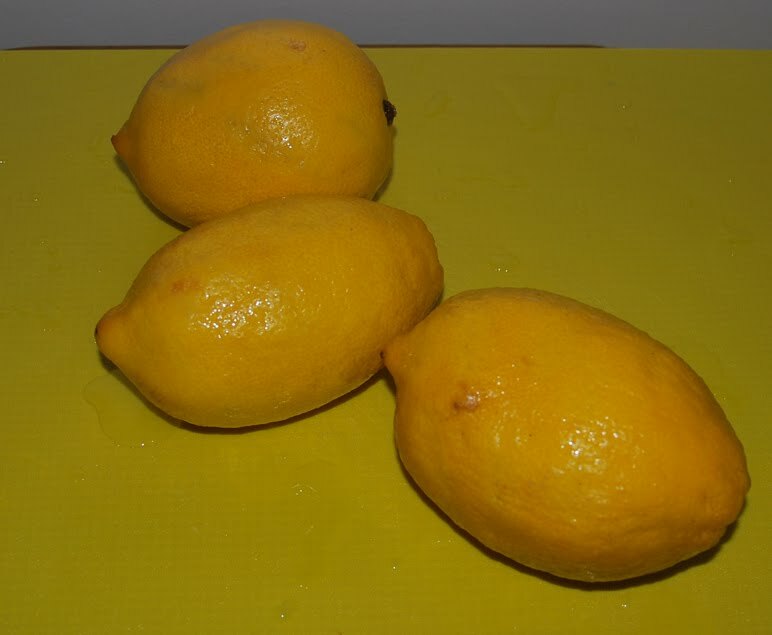 In Coria’s recipe the lemons were soaked (un-pricked) for 24 hours. One recipe suggested mincing, the other grating the fruit. Grammatico / Taylor Simeti suggested weighing the pulp and using 1¼ their weight in sugar. Coria suggested adding 2 kilo of sugar for every 3 kilo of pulp and 1 cup of water, but what I liked about his recipe was the addition of a cinnamon stick which was also mentioned in many other of my older Italian publications (most that do not include amounts of ingredients). placed the conserva into hot sterilized jars. The flavour of my conserve is very intense and very lemony, but the texture is a little rubbery (maybe I cooked it too long). I am also disappointed that I am unable to taste the cinnamon and noticed that the sticks also break up during the cooking. I expected the conserve to be a lighter colour – the cinnamon may have contributed to the darker shade. I wanted my conserva to be perfect and to give a jar of it to Marianna. It seemed a fair exchange – my labour of love, for many of hers. Cedro is used in Cassata and Panforte (not Sicilian). Bitter Almonds Recollections and Recipes from a Sicilian GirlhoodCedroCedro and lemonsDolcettiFor cake makingFor Sicilian PastriesGiuseppe CoriaLemon ConserveLemon JamMaria GrammaticoMary Taylor SimetiProfumi Di Sicilia. When I was in Palermo last September there were bunches of tenerumi on sale at the markets – these are the stems, leaves and tendrils of those long, twisted green zucche (squashes) that grow in Sicily and Calabria. The long serpent like squashes are called zucche serpente and you can guess why. Those of you who have travelled to Sicily in summer may have seen these very unusual vegetables and perhaps not known what they were. Both the squash and the greens are eaten and are considered rinfrescanti (cooling and refreshing for the body). The zucca (singular) and the greens are a Sicilian summertime specialty and I have not seen this type of squash growing in Australia yet. The greens are usually made into a wet pasta dish and, unfortunately, it is not a dish you will find in a Sicilian restaurant. It is a typical, home-cooked, soupy dish with the flavours of summer: red summer tomatoes, garlic, basil, thickened with broken spaghetti and enhanced with a drizzle of good, extra virgin olive oil. I first ate this soup in Augusta and it was cooked by one of my cousins, Lidia. In her version, Lidia used both the zucca and the greens. My relatives in Ragusa do not cook minestra di tenerumi very often – it is considered to be a dish typical of the regions of Palermo and Catania. (My mother’s side of the family originally came from Catania). I was very pleased to eat minestra di tenerumi again recently when I visited a friend’s home in Bosco Falconeria, close to Castellammare (on the north coast, west of Palermo). I appreciated this simple, flavoursome dish for many reasons. Firstly, it was all produce picked fresh from Mary’ Taylor Simeti’s own garden. This included the olives used to make the fragrant, extra virgin olive oil and the organic wine we drank made by her husband, Tonino. Photo above is the soup and how Mary presented. Mary Taylor Simeti is one of my heroes – I think that sometimes it takes a “foreigner ‘ with a passion to rediscover and tease out the history behind the food ( not that she is a foreigner, she is part of Sicily, having dedicated so many years to writing about it in numerous books and articles). Secondly, I was very pleased to be presented with such a simple dish. In my normal diet I eat a lot of vegetables and when I travel and eat in restaurants and trattorie, I crave freshly cooked vegetables – I can’t wait to get back to friends and relatives. Besides, these are not the typical vegetables or cooking found in Sicilian eateries and Mary, our host, knew that some of us who had been invited to eat at her table would never have eaten this. We all loved it. Mary presented this simple dish with small cubes of caciocavallo – a special DOP Sicilian cheese (cascavaddu in Sicilian) produced mainly in the province of Ragusa. I once used the very young shoots of the zucchini plants (complete with the flowers and young zucchini) to make this soup – different, but nevertheless, rinfrescante and a celebration of summer. Although we may not be able to buy tenerumi in Australia at this stage, we may not have long to wait. I was fascinated to see one of the episodes of Sean Connelly’s Family Feast on SBS. It featured the food of a family of Africans from the Democratic Republic of Congo. They are living in the Western suburbs of Sydney and are growing African leaf vegetables; on the program the family were harvesting and eating tendrils very like tenerumi. These tendrils were the shoots from a different type of squash plant, but would probably taste very similar to the Sicilian variety. 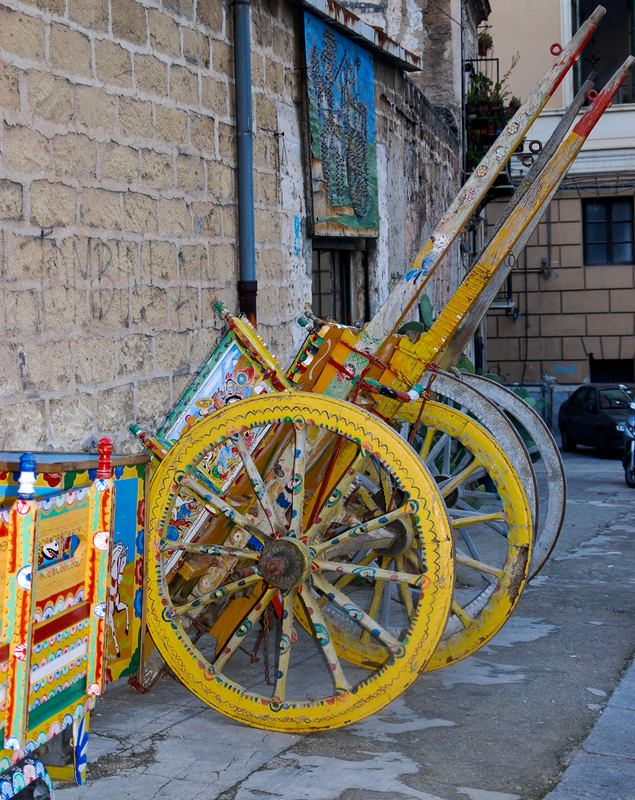 As in all Sicilian food, there are local variations. Some substitute the garlic with finely chopped fresh onion, others add anchovies, but personally, if it is to be rinfrescante – refreshing, anchovies are not suitable. Here is a recipe which suits my tastes for making minestra di tenerumi (excuse me Mary if this is different to your recipe). The wet pasta dish is cooked very quickly. Prepare the shoots and tendrils, discard the tough stems, separate into small bits. Add the tenerumi to boiling, salted water and bring to the boil again (estimate 3 cups of water per person). Add the pasta and cook. While the pasta is cooking, toss the tomatoes into a hot frying pan with about 3 tablespoons of the oil, add garlic and chilli, salt and some of the basil and heat through for a few minutes. When the pasta is cooked, check that you have the correct consistency – it should be like a very thick soup and you may need to drain some of the liquid. Add the warm tomato mixture and more basil. Drizzle with your best extra virgin olive oil and serve. Cheese is optional. I prefer it without and appreciate the fresh taste of the dish. This photo of marzipan fruit (also called Frutta di Martorama) was taken in a pastry shop in Catania. This pasticceria has shaped the marzipan into a variety of shapes: apples, apricots, oranges, prickly pears, different varieties of plums, cherries, green figs, pomegranates, pears , chestnuts and almonds. I make marzipan when I make cassata di ricotta which I cover with a thin coat of pale green marzipan (I use a drop of green food colouring. In earlier days my mother used to use a little puree made with wilted spinach leaves). Sometimes I also add a proportion of ground pistachio nuts to the almond meal. In one of my previous posts I have included a non traditional, simple recipe for making marzipan and for shaping marzipan fruit. I like this version because it is less sweet. In a bowl whisk the egg white with the salt until frothy. Whisk in the vanilla. Gradually stir in the almonds and the sugar, kneading as you go to form a smooth, pliable dough. Add more almond meal and/ or icing sugar if it is too soft. The most authentic recipe that I have found is in the book called Bitter Almonds, Recollections and Recipes from a Sicilian girlhood. The book was researched and written by Mary Taylor Simeti and it contains recollections and recipes of Maria Grammatico, famous for making almond pastries. 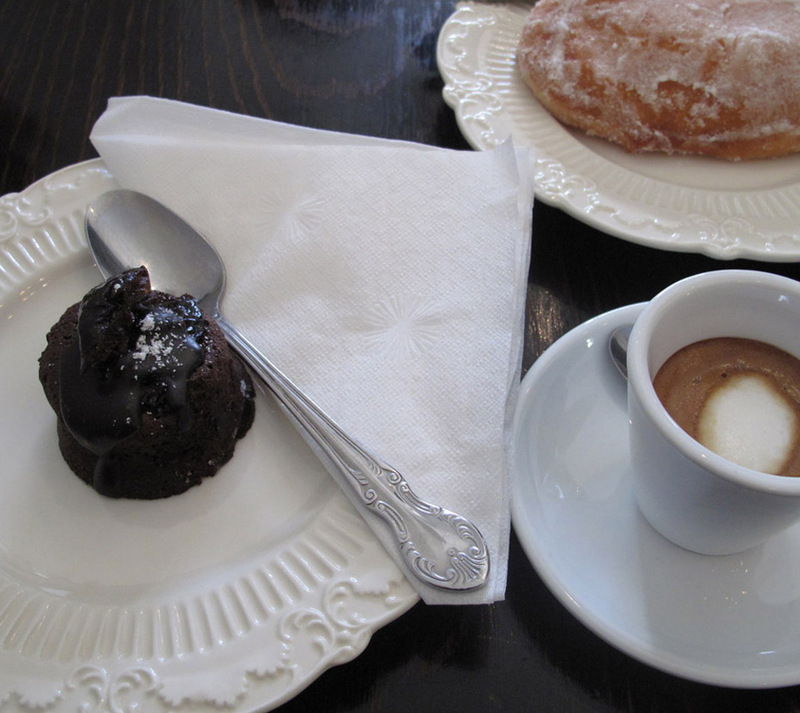 She has a wonderful pastry shop in Erice and I visited this recently (in September 2009). This is the recipe as written in the book. In a meat grinder or a food processor, grind the almonds with about 2 tablespoons of the sugar until very fine, almost powdery. In a food processor or in an electric mixer, combine the nuts, the rest of the sugar, the water, vanilla, and the almond extract, if using. Process or mix until the paste is very smooth. Remove to a marble slab or other cold work surface dusted with confectioners’ sugar and knead briefly by hand. Wrap in plastic wrap and refrigerate until ready to use. Marzipan will keep almost indefinitely in the refrigerator. This makes 800gr of marzipan. A particular specialty at Easter time in Sicily are the pecorelle pasquali (marzipan lambs). These lambs are from Pasticceria Spinello in Modica Sicily (it is near Ragusa where my relatives live). In Sicilian they are called agneddi (lambs)or pecuredde (small sheep) di pasta riali. . They are often filled with citron jam or paste made from pistachio nuts. I once bought one for my mother and she still has it, 20 years later. She said that it was too pretty to be eaten. It was never kept in the fridge – it is a little bit dusty!